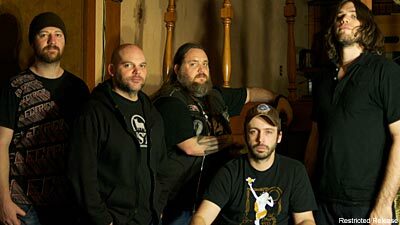 With most of the members of the Company Band doing double duty in successful, touring bands -- like CKY, Clutch, Fu Manchu and Fireball Ministry -- it's hard to pull off a project such as this without sacrificing time in the other, main projects. But The Company Band are doing their best to achieve a sense of hard rock balance. "During CKY downtime ... that's when I get to do this," TCB drummer Jess Margera told Noisecreep. "It's challenging, getting together to play shows. We've played two shows so far," Margera revealed. "CKY's touring is out of control and Clutch's is worse than ours! It is tricky to get it done." If anything, not being able to tour as much as they'd like certainly adds to TCB's mystique and "must see" status when they do play a show! But the Company Band certainly work to make it work. Margera admits he would like to play a bunch of shows at the tail end of this year and next, to give fans a taste of what's brewing. "We did this album in a week, pretty much," Margera said. "It was during a week last winter when all of our schedules were clear, and that never happens, so we were like, 'Now is our chance.' And we took it." Technology was certainly crucial and instrumental in TCB getting their record made. "Thank God for the Internet," Margera laughed. "We demoed and wrote songs through emails basically. We traded the files and back forth, so when we get together, we knew the music. Now, it's just about getting together and doing fine-tuning. We don't plan it. We do whatever sounds cool to us. There is definitely an old school rock vibe to it, you could say. I like to think of it as all our bands blending into one." Furthermore, Margera said, "Get the record, it's f---ing good." It's self-titled, and it's out Nov. 10.